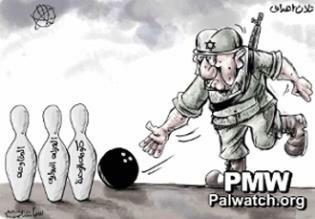 The official PA daily published a cartoon showing a soldier with a Star of David on his helmet hurling a bowling ball at three pins – suggesting the three things Israel is allegedly trying to do away with through its operation in search of the three kidnapped students. This cartoon refers to Israel's response to the kidnapping of three Israeli teenagers in the West Bank on June 12, 2014. Israel responded to the kidnapping by conducting house-to-house searches in Hebron and arresting hundreds of Hamas members. PMW has documented that in the days following the kidnapping, the motif of the number three appeared in numerous celebratory images on Fatah's Facebook page and in the official PA daily Al-Hayat Al-Jadida. The cartoonist here uses the motif of three to blame Israel for using the kidnapping as an excuse to strike down Palestinian goals.